On April 13, 1961, Yuri Alekseevich Gagarin visited the city of Kaluga to participate in laying the main brick in the future walls of the City Museum on the historical events of cosmonautics named after Tsiolkovsky. Citizens always with pathos tell about this historical episode. And the coin thrown into a brick wall by him, and the trowel are in this museum today. These are memories of the first cosmonaut of the USSR. 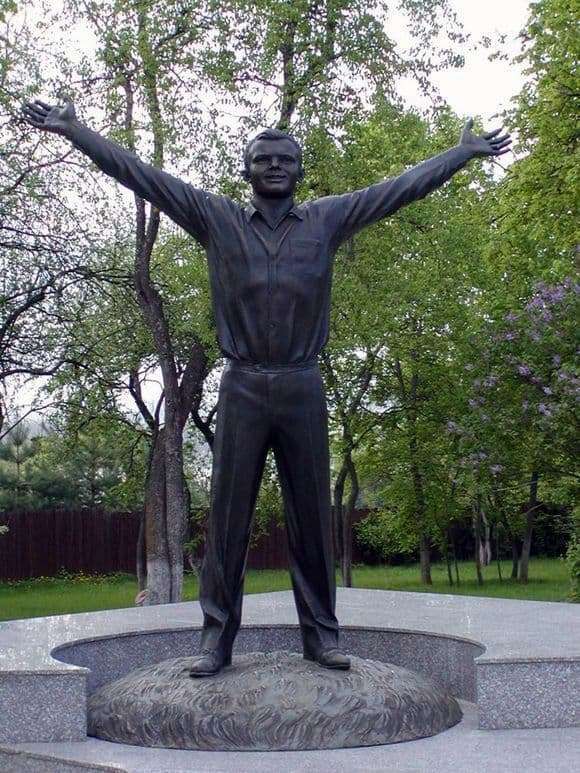 And in 2011, on the ninth of April, on the eve of the Day of Cosmonautics in Kaluga, a celebration was held to mark the opening of the sculpture to Y. Gagarin. Exactly fifty years have passed since its flight into space. Gagarin is considered the pioneer of space and the first architect of the museum. Therefore, the monument was installed in front of the building. The figure of Gagarin is made to his full height, though slightly exaggerated in size. Its height reaches two and a half meters. But at the same time she does not possess any pretentiousness and pathos. The author of this monument is the sculptor Alexey Leonov. Before us is an ordinary simple person, only made in bronze. He is wearing ordinary clothes: a shirt and trousers. He stands confidently on Earth, her part is also made by the author. Gagarin stands, arms spread wide. He wants to embrace the whole world, all the infinity. On the face is captured a wide and good-natured smile. Sincerity is read in his features, his eyes glow with happiness. Looking at this sculpture, people also begin to smile and remember something good. It seems to all museum visitors that he meets them with open arms. Visitors to the city must visit this monument, because around him you feel yourself a part of the universe. Everyone wants to touch at least a little bit of history, walk along the roads along which the hero has walked, learn something new and interesting from his life. Near the monument is the union of all generations.